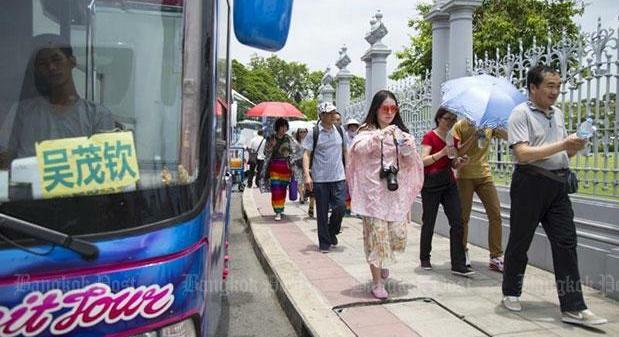 BANGKOK: The recent crackdown on zero-dollar tour operations is having a short-term impact on the tourism industry, with the number of Chinese visitors expected to drop 20 per cent this month. Arrivals of Chinese tourists during the Sept 1-11 period tallied 690,375, falling 16% shy of the targeted figure, according to a post-crackdown report by the Tourism and Sports Ministry. “The impact will only be short-lived and the number of Chinese tourist arrivals is expected to fall by 20% this month,” said Tourism and Sports Minister Kobkarn Wattanavrangkul. Last week, the Anti-Money Laundering Office confiscated more than 2,000 coaches and over B4.7 billion in cash from OA Transport Co in Lat Krabang district. The company was suspected of involvement in illegal zero-dollar tour operations. Year-to-date Chinese tourist arrivals have surged 19.3% to 6.88 million. Arrivals during the Sept 1-11 period were up 33.7% year-on-year. Of total Chinese tourist arrivals, 60% are so-called free independent travellers and 40% come in tour groups. Among the tour-group visitors, 50% are lured to Thailand with zero-dollar tour packages. Despite the zero-dollar tour crackdown, Ms Kobkarn is still confident that Thailand will achieve its tourism revenue target of B2.4 trillion this year. “Chinese tourists will remain the growth driver for tourism in the last quarter, which is expected to generate B133 billion in revenue,” she said. Last year, Thailand welcomed 7.9 million Chinese tourists. The number is expected to increase to 11-13 million this year. Surachet Hakpan, commander of the Tourist Police Division, said the crackdown on OA Transport, which is considered the biggest zero-dollar tour network in Thailand, is expected to wipe out this kind of illegal tour operation. Zhang Xinhong, director of the China National Tourism Administration, said it will cooperate with the Tourism and Sports Ministry and related agencies to improve tourism standards and quality for Chinese tourists. “We hope there will be more quality tour programmes at affordable prices for Chinese tourists thanks to the crackdown by Thai authorities,” she said. Nasa12: these busses now are on the road again? So, no clampdown, no confiscation? Do you mean, 'half way the law' there will be a 'escape'? Kurt@ This busses are on the road again believe me. I red in different thai newspapers about this 'Zero dollar clampdown'. Confiscation of more than 2,000 coaches, over B4.7 billion in cash. And the company was suspected of illegal activities.